I'd had one of those really awful days at work yesterday, and it was with something of "Thank God for this!" that I picked from the mailbox, my copy of the UK blu-ray for James Whale's The Old Dark House (TODH). I had heard of this Universal / Carl Laemmle Jr production years ago in the same context as The Cat and the Canary. I had then even watched it in a horribly poor public domain rip where you could barely make out some of the darker scenes and the audio was rife with drop outs and slowdowns and all manner of distortion. Visually, this new new 4K restoration (by Cohen Films) is a revelation and one can properly admire the opulent Gothic production design and Whale's lighting choices. The audio still has some issues with hiss and higher frequencies but what you have here is far superior to any previous release, which means that the film can be judged on its own terms, so how does it hold up? TODH is set in a remote mansion to which different sets of travelers rush to ask for shelter in the midst of a torrential downpour and landslide. The first group consists of the bickering Waverton couple (Raymond Massey and the lovely Gloria Stuart) and their debonair bachelor friend Penderel (Melvyn Douglas), while the second is the self-made wealthy Sir William Porterhouse (Charles Laughton, seeming to use a Scottish/Welsh accent, I can't say which) and his "companion" Gladys (Lilian Bond). While a dry roof and a fire would seem just what these wayfarers need, they are intimidated by their very strange hosts, the Femm family, and their imposing valet Morgan (Boris Karloff, doing another dialog-less monster part for Whale). 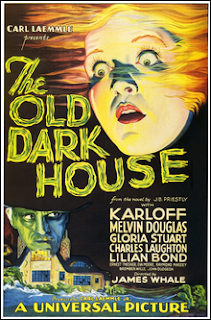 TODH is an interesting combination of screwball comedy and Gothic horror, and manages a nice balancing act between the two. Whale as director makes some excellent use of traditional horror devices like mirrors and shadows and locked doors. Unlike some latter-day classics of horror-comedy it is not a genre spoof / send-up. Of course, for these modern days, the horror element is rather dated (and the non-immersive sound quality keeps the action at a distance), and for a while one may wonder if the film is going to be anything other than a comedy of eccentric manners, but there are some effective moments once Morgan goes berserk and the insanity of the Femm family is on full display. Soaking in its pleasantly creaky atmosphere (with some Bailey's Irish Cream at my side), I had a nice viewing experience. TODH is not a "Universal" (ha!) recommendation but anyone who likes their old horror pictures should give this one a shot.